£30 Off Women's Fila Disruptor II at JD Sports Get this seasons must have trainer- Fila Disruptor II at JD sports now £30 off with this mega discount code. 50% Off Selected Styles in the Easter Sale at JD Sports- Nike, adidas, FILA and More! Don't miss out on amazing offers this Easter at JD Sports including trainers, clothing and accessories. 10% Student Discount on Orders at JD Sports Students, enjoy 10% off your JD Sports order with Unidays! 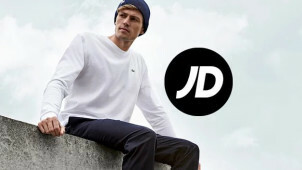 Up to 50% Off adidas Styles at JD Sports- Sportswear, Footwear & Accessories Massive discounts on big brands at JD Sports. Get up to 50% off adidas now! 50% Off Selected Fred Perry Styles at JD Sports- End of Season Sale Women's, men's and children's Fred Perry styles now up to 50% off in the JD Sports end of season sale! Free Next Day Delivery on Klarna Orders at JD Sports Pay using Klarna today at JD Sports and get your goods delivered next day for free! JD fuses fashion and sport to create a store that offers both style and top performance gear to suit you, no matter what you sport you choose to play. Pick up the latest pair of Nike trainers, a brand new Puma tracksuit, or choose something from Lacoste and add some serious sports-luxe style to your look. Stocking a range of popular brands like Adidas, Nike, Fred Perry and more - here you can find an eclectic mix of street style and practical sporting attire that makes the JD Sports website a one stop shop for your energetic lifestyle. With JD Sports, you can take your sport to the next level. Whether you're a professional runner or perhaps swimming is your hobby - here you can find the goods to motivate you and help you excel where you need it most. With accessories, state-of-the-art footwear, apparel and more for the whole family - both big and little feet can reach their goals and turn their fitness dreams into reality with JD Sports. Click 'Checkout Securely' to finalise the order. JD is never short of sportswear deals- make sure you always discover the latest looks for less by signing up to the JD Sports' newsletter. Does JD do free delivery? UK Standard delivery is free on orders over £60, plus with free click and collect on all orders - you can get your goods delivered to your local store within 3 to 5 days. Do check the other delivery options here. Will trainers go into the JD Sports Black Friday sale? You never know, from Nike trainers to sports accessories and cool apparel, you're sure to find heaps of trendy items for less when the JD Black Friday event comes around. Not at the moment, but they have an amazing clearance section to make up for it where you can find heavily discounted items for men, women and children. Shop footwear and cool apparel with up to 50%. What are the JD opening hours? Use the store finder to check where your local store is and its opening times by using your postcode. UK Standard delivery takes 3-5 days and costs £3.99. Click & Collect and Next Day Delivery is also available, check here for more details. You have 14 days to notify JD should you wish to cancel an order and you should return your goods within 14 days of the cancellation. You can return items for exchange within 28 days - do see the Returns policy for more information. Call them 24 h a day on 0161 393 7055. Via Twitter using @jdhelpteam. Do tweet your order number for a quicker response. Upgrade your sporting gear this summer with the amazing range at JD Sports. At JD, you can rest assured that you’re shopping with the pioneers of the sporting industry. Offering you quality performance gear which is nonetheless stylish too - with a JD Sports discount code you can shop a world of goods to support you and your fitness. Proud to stock only renowned brands you love - JD Sports will keep you feeling fresh on every workout. The JD Sports’ app is where you can shop 24/7 and get access to amazing offers, deals and sporting news. Here is where you will find the hottest trends as well as loads of information on new brands and sporting must-haves. Download it to your favourite devices, pick up a JD sports discount code, get JD on the go and you won't miss a thing. If you're keeping fit this summer, check out the JD Sports accessories section. It’s full of useful apparel and more to complement your fitness regime as well as your outfit! For women's sports' bras, performance vests, socks and more - you can find it all here for less with a JD Sports voucher from vouchercloud. Shop for the whole family and everyone can get moving and up their fitness game come rain or shine.